On groundlevel you find two apartments: blauw and rood. On the first floor there are two more apartments: geel en groen. The second floor has four doublebed rooms, each with its own bathroom. 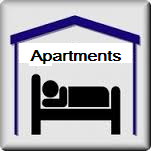 All apartments and rooms have their own atmosphere; are heated centraly and have their own warmwater supplies.